[163 Pages Report] The North American packaging tape printing market is projected to grow from USD 5.4 Billion in 2015 to reach USD 7.0 Billion by 2020, at a compound annual growth rate (CAGR) of 5.4% from 2015 to 2020. Printing on the packaging tapes highlights the company’s name and logo, enables ease of stock handling and identification, enhances the visibility of product, and safeguards the merchandise during transit. It also makes the product visually appealing, thereby resulting in instant recognition of the packages. The report aims at estimating the market size and future growth potential of the North American packaging tape printing market across different segments such as product type, material, printing ink, mechanism, end-user industry, and country. The base year considered for the study is 2014 and the market size is projected from 2015 to 2020. The growth of the market has continued to remain robust with a significant number of brand owners harnessing the printing technology in packaging tapes. 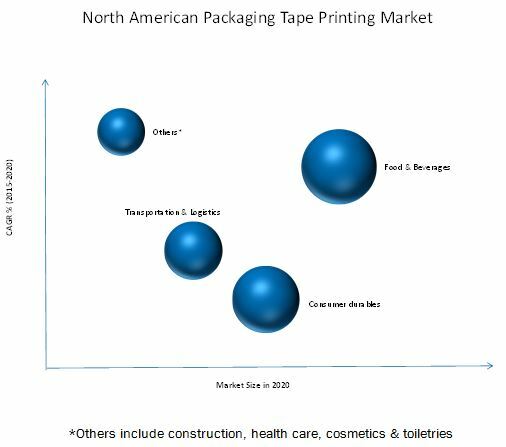 The North American packaging tape printing market is dominated by key players such as Quad/Graphics Inc., Hewlett-Packard Development Company, L.P., Xerox Corporation, E.I. du Pont de Nemours and Company, and RR Donnelley & Sons. Other players such as Canon U.S.A., Inc., FLEXcon Company, Inc., SIAT S.p.A, W.S. Packaging Group, and Cenveo, Inc. accounted for a significant contribution in the printing market, which can be leveraged by the packaging tape printing industry to attain high growth in the near future. MarketsandMarkets forecasts the North American packaging tape printing market size to grow from USD 5.4 Billion in 2015 to reach USD 7.0 Billion by 2020, at a compound annual growth rate (CAGR) of 5.4% from 2015 to 2020. This high growth of the market can be attributed to the fact that a significant number of brand owners are harnessing printing technology over packaging tapes. Growth in the packaging printing industry, demand for aesthetic appeal, product differentiation, and technological advancements are some of the drivers behind the growth of the packaging tape printing market. Printing on packaging tapes highlights the company’s name and logo, enables ease of stock handling and identification, enhances the visibility of product, and safeguards the merchandise during transit. It also makes the product visually appealing, thereby resulting in instant recognition of the packages. The North American packaging tape printing industry has undergone significant transformation from being a heavy machinery using industry to a more software-centric business model. Nowadays, printer convertors are well-equipped with the latest computer-controlled printing machines and flow lines for binding, while state-of-the-art digital technologies are used in pre-press. Increase in demand for digital printing is an opportunity for the packaging tape printing market due to rise in demand for economical, sustainable, and innovative printing technologies. The advent of global brands, rising consumerism, and growth of the packaging industry have increased the scope of the packaging tape printing market. Water-based inks offer better performance and low printing cost with less damage to the environment. They exhibit high level of compliance with the current environmental protection standards. Water-based inks are expected to hold the largest market share and dominate the packaging tape printing market from 2015 to 2020, as the increased demand for ink having low volatile organic compound (VOC) content is fueling the market to grow. UV curable inks are expected to witness the highest growth rate during the forecast period. As these inks are cured by exposure to strong UV light, they can be applied to a wide range of uncoated substrates and produce a very robust image. UV curable inks dry as soon as they are cured, thereby enhancing the print speed. These inks possess high density owing to which they are also capable to print on to rigid substrates. Digital printing in the packaging tape printing market is the fastest-growing printing mechanism with its ability to provide a high-quality and cost-effective solution for manufacturing high designed printed tapes along with the recycling options. Printer convertors are adding digital printers in their printing press to leverage its benefits of improved productivity, reliability, and cost-effectiveness over higher runs. Food & beverages, consumer durables, and transportation & logistics are some of the end-user industries contributing towards the high growth of the packaging tape printing market. The food & beverage industry is projected to witness the largest market size owing to the increased demand for innovative packaging and printing technologies in order to enhance the visibility of packaged products. The market is also projected to witness growth in the consumer durables, transportation & logistics, and other end-user industries during the forecast period. The market of hot melt carton sealing tapes is expected to be the largest in terms of value, during the forecast period. The high demand for hot melt carton sealing tapes in a large number of industrial applications has contributed significantly in accelerating its demand in the packaging tape printing market. Polypropylene in the packaging tape printing market is expected to attain the largest market size, during the forecast period. Polypropylene films, which are very strong and rigid in nature, are one of the most versatile, economic, and pre-potent barrier films that offer excellent moisture barrier, temperature resistance, clarity, gloss, durability, the ability to print, embossability, aroma strength, dimensional stability, and processibility. It has emerged as an economically viable alternative for packaging converters, thereby commanding a major market share in the packaging tape printing industry. The U.S. is expected to hold the largest market share and dominate the North American packaging tape printing market from 2015 to 2020. The U.S., being the largest manufacturer and supplier of printing materials and equipment, exhibits high-potential growth opportunities for the packaging tape printing market. However, the market continues to face challenges due to demand for high-quality printing at low cost while adhering to the government regulations. The major players in the packaging tape printing market include Quad/Graphics (U.S.), Hewlett-Packard Development Company, L.P. (U.S.), Xerox Corporation (U.S.), E.I. du Pont de Nemours and Company (U.S.), RR Donnelley & Sons (U.S.), SIAT S.p.A (Italy), and others. These players adopted various strategies such as new product developments, mergers, partnerships, collaborations, and business expansions to cater to the needs of the packaging tape printing market. 14.2 Hewlett-Packard Development Company, L.P. Figure 32 SWOT Analysis: Hewlett-Packard Development Company, L.P. Figure 35 SWOT Analysis: Quad/Graphics, Inc. Figure 38 SWOT Analysis: Cenveo Inc. Figure 40 SWOT Analysis: Canon U.S.A, Inc. Figure 41 SWOT Analysis: W.S. Packaging Group, Inc.